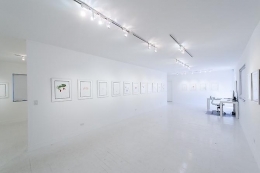 Gavlak Gallery is pleased to present two print portfolios in their entirety. The first by the London based artist Aleksandra Mir (B. 1967, Poland) and the second by Pop Artist Andy Warhol (B. 1928, Pittsburgh). 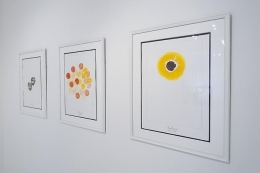 These series are brought together here for their similarities in the artists' whimsical and outlandish take on traditional botanical prints and cookbooks respectfully, and are associated with the best hostesses in the most tasteful homes of the Upper East Side and Palm Beach. 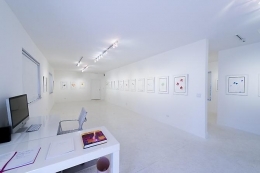 "The Meaning of Flowers" was produced by Mir while living in Palermo, Sicily in the summer of 2006 and was first presented at Art Basel Miami Beach (Gavlak Gallery) that same year. Drawing upon the classic notion that flowers are imbued with meanings and a specific set of semantics with idealistic and hopeful connotations, Mir has edited and revised the botanical code to a more current and socially relevant fashion. The new meanings suggest insecurity, doubt, fatigue, betrayal and reconciliation, which are symptoms and elements that comprise the majority of romantic relationships but are never presented in this traditional format. 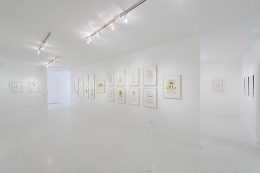 Combining both "high" and "low" fine art techniques, that of the elegant letterpress that recalls old world civility and the pressed fruit and vegetables harnessed from local markets harkens back to kindergarten art activities, a completely new and idiosyncratic type of botanical print is created. 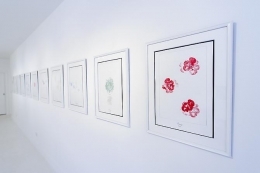 "The Meaning of Flowers" consist of 40 motifs on 19 x13 inches of hand torn paper, printed in an edition of twelve with two Artist's Proofs. Each set fits into a handcrafted, gold embossed portfolio sealed with a pink satin ribbon. Andy Warhol's pre-pop portfolio "Wild Raspberries" was created with Suzie Frankurt in 1959 as a humorus take on cookbooks. 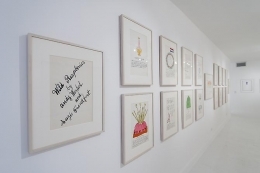 The whimsical faux recipes appear in 18 offset lithographs with hand coloring, which Warhol would have his friends help him paint at coloring parties. Dishes such as "Omelets Greta Garbo" and "Piglet" instruct the viewer: "Contact Trader Vic's and order a 40 pound suckling pig to serve 15. Have Hanley take the Carey Cadillac to the side entrance and receive the pig at exactly 6:45." 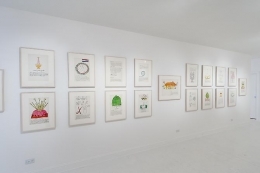 The drawings and handwriting are examples of the work Warhol created while also working as an illustrator prior to his iconic Pop images of movie stars, soup cans and brillo boxes.